It is time for the progressive movement to reckon with structural racism: its role in enabling it and its moral responsibility to actively dismantle it. It’s not a request: it’s a requirement for all presidential candidates that seek progressive votes, and for a political movement that seeks any hope for relevance in a diverse America. It’s long past time for Democratic candidates to stop taking black voters for granted, as was made clear this weekend at Netroots Nation, the largest annual gathering of progressive activists in America. At the Presidential Town Hall on Saturday morning, two Democratic Presidential candidates – former Maryland Governor Martin O’Malley and Vermont Senator Bernie Sanders – publicly floundered when faced with activists from #BlackLivesMatter. Governor O’Malley’s tone-deaf response – “Black lives matter, white lives matter, all lives matter” – earned him boos from the crowd; he left the stage shortly after and later clarified his remarks with the news site This Week in Blackness. Bernie Sanders, with the presidential gravitas of a toddler, first attempted to shout his usual stump speech over the protestors, and then scolded them for interrupting him and held what one could only describe as a mini public tantrum. Netroots Nation is no stranger to public protest: demonstrators have interrupted politicians from House Minority Leader Nancy Pelosi to former President Bill Clinton. And shutting things down is business as usual in progressive politics writ large: progressive activists regularly heckle political leaders and organize demonstrations to protest going to war in Iraq, the war in Afghanistan, government surveillance, climate change, Keystone pipeline, reproductive rights, marriage equality and many other issues. 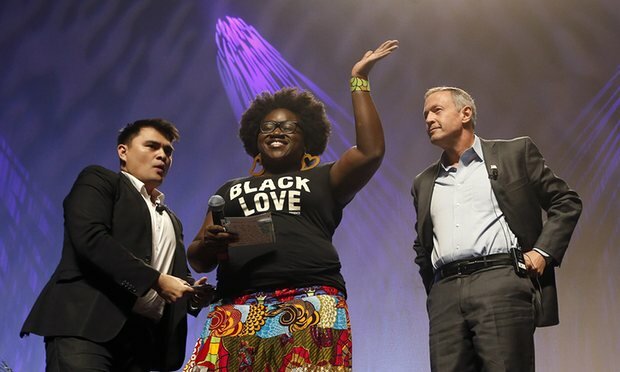 Yet when #BlackLivesMatters demonstrators demanded that candidates explain what they will do for racial justice, Netroots organizers surreptitiously flashed an apology for Governor O’Malley on the teleprompter for the disruption. Sanders supporters, meanwhile, flooded Twitter to dismiss critiques, criticize demonstrators for interrupting the economic stump speech and to attempt to civil-rights-splain to racial justice organizers about the Senator’s actions during the civil rights movement. If Netroots is, as Sam Drizell wrote in TIME, “a Shangri-La for progressive idealism”, then why is there such discomfort within the movement when some attempt to demand specifics from politicians on how to dismantle structural racism? Or more alarmingly, why is there such discomfort among candidates seeking public office with discussing America’s racial reality? The civil rights blind spot in the progressive movement cannot be fixed without addressing the truth that there cannot be economic progress for all without racial justice. In previous races, Sanders has not had to build a diverse coalition of support to win elections; his past campaigns have made little or no reference to issues of deep importance in black communities, such as voting rights protection, housing discrimination and mass incarceration. He speaks almost exclusively among issues which thrill white liberals: campaign finance reform and economic justice. There is a political cost to creating silos within movements: politicians and citizens end up speaking of the same issues with different languages, with a lack of empathy and connection. Though Sanders’s policy proposals likely align with number of black voters, his ability to address race is limited to the scope of wealth and the economy. But black voters and organizers need to know why they should fight for Bernie Sanders’ vision of our economic future when our humanity is in constant peril. True political inclusion of black voters in the progressive movement will reveal racial justice and economic progress as inextricably linked, and that there is no need to forsake one for the other (or to solve one first and fix the other later). But, as #BlackLivesMatter supporters continue to drive change in the political conversation, it becomes more obvious that racial justice is a siloed issue operating within a largely-white progressive movement. The clash between what progressives declare their values to be and the issues on which they’re willing to take action will continue as the progressive movement and candidates alike seek to engage an increasingly diverse rising electorate. We do not need talking points. We need government to help save our lives, and we need to elect leaders who will champion our humanity. What will you advance in an agenda that will dismantle structural racism in this country? The world is watching. And we’re ready to shout to be heard.